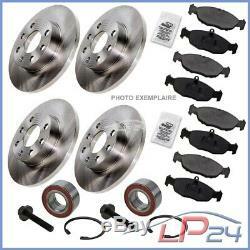 Complete brake kit front and rear axle + wheel bearing + abs ring rear axle. Attention: take into account the restrictions on numbers pr !! You will find additional information in the vehicle model table! 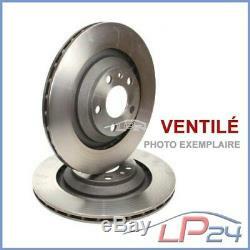 2x brake disc ventilated front axle 2x brake disc full axle rear kit (4 pieces) brake pads front axle kit (4 pieces) brake pads rear axle 2x brake anti-squeal paste (do not apply on the friction surface brake pads or discs) kit (4 pieces) wheel bearing rear axle 2x ring abs rear axle. Before purchasing, please check the information shown in the vehicle model table! Please, take into account the chassis number in the vehicle table before purchase. You will find an explanation to the chassis numbers under: point 1.6 of our faq. Brake disc front axle ventilated diameter: 280.00 mm thickness disc brake: 22.00 mm height: 46.3 inside diameter: 146.5 number of holes: 5 number of holes 2: 9 interaxial: 112 with code mapp thickness minimum: 20 surface: coated center distance: 68 kit brake pads front axle thickness: 19.60 mm width: 119.10 mm height: 69.50 mm with wear warning contact suitable for braking system: lucas / trw disc brake rear axle solid without ABS ring without wheel bearing thickness brake disc: 10,0 diameter: 245,00 mm height: 83,60 mm number of holes: 5 interaxle: 112,00 set of brake pads rear axle thickness: 17 , 20 mm height: 52.90 mm width: 87.60 mm unprepared for wear warning contact suitable for brake system: trw kit wheel bearing rear axle width: 15.00 mm / 17.00 mm inside diameter: 19,00 mm / 29,00 mm outer diameter: 45,00 mm / 50,00 mmmm ring abs rear axle dia inside meter: 67.00 mm outer diameter: 107.00 mm thickness: 6.00 mm number of teeth: 45. Warning: in the European Union, the brake pads must have a valid ee / 90r certification. We only sell brake pads with said certification. Our promise of quality: 3 years warranty on function and accuracy of fit ... Quality product - new - fully assembled. 180 days guaranteed return free return. You will find our conditions of return in our information for the customers. Please note that you will receive your invoice from us in pdf format by email. For this purpose, please check your mailbox and possibly your spam folder. By saving consumables such as paper and ink / toner, valuable environmental resources will be preserved. An accurate identification of the pr number (equipment feature code) is very important in determining whether the item fits your vehicle or not? You will find further information in point 1.2 of our faq. Please note the restrictions indicated in the table. 11.94 - 10.00. From the chassis number: 8d-x-200001 for the number pr: 1lz location: front axle location: rear axle. 07.00 - 11.00. 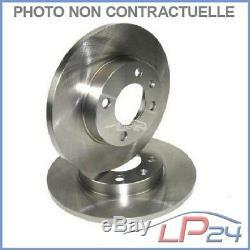 For the number pr: 1lz location: front axle location: rear axle. 11.94 - 11.00. 01.95 - 11.00. 12.95 - 11.00. Audi a4 front (8d5, b5). 11.94 - 09.01. 07.00 - 09.01. 02.96 - 09.01. 03.96 - 09.01. Corresponds to the following oe numbers. 3-Piece universal hub puller puller kit ## pro brand car parts distributor ##. 1x rear brake caliper right audi a4 b5 8d 1994-01 a6 4b c5 1997-05 ## pro brand car parts distributor product ##. 2x brake caliper rear left + right vw passat 3b 3bg 1996-05 ## for brake system: lucas / trw !! 1x rear brake caliper left audi a4 b5 8d 1994-01 a6 4b c5 1997-05 ## pro brand car parts distributor product ##. Kit set universal box for flaring of brake ducts in nine parts new ## product of brand distributor pro auto parts ##. 5l liters 5w-40 castrol edge fst turbo diesel engine oil API sn / cf ### reinforced by titanium fst ###. Kit set of tools pushes piston brake caliper 13 pieces vw volkswagen ## product brand distributor pro auto parts ##. 5l liters 10w-40 a3 / b4 castrol magnatec engine oil renault rn0700 / rn0710 ## product brand distributor pro auto parts ##. 1 liter castrol titanium fst 5w-30 ll motor oil acea c3 # quality mark of the German castrol dispenser #. 5l liters 0w-30 castrol edge fst engine oil 0w-30 ### fully synthetic ###. 5l liters 5w-40 c3 castrol magnatec motor oil acea c3 ## branded product distributor pro auto parts ##. Kit set of tools pushes piston caliper brake 18 pieces peugeot renault ## product brand distributor pro auto parts ##. 5l liters 0w-40 a3 / b4 castrol edge fst engine oil bmw longlife-01 ### reinforced by titanium fst ###. 5 liter castrol titanium fst 5w-30 c3 engine oil bmw longlife-04 # quality mark of the German castrol dispenser #. 180 days guaranteed return period. We do not ship to regions with the following postal codes: im (isle of man), gg (guernsey), i (jersey). We do not deliver to the following postcodes: im (isle of man), gg (guernsey), i (jersey). 3418120012 - 3418112012 - 3418111012. C00791253 ca0c627b9 cfc4bb944 c8b0117ea cbffe460e c1705f29a cc4c7778c c269e4463 c5a924bbd ca74c2c3c. Wide range of products for all car brands. Always more than 800,000 pieces in stock. Original new parts from all renowned manufacturers at the lowest prices. Express shipping within 1-2 business days. Secure and flexible payment possibilities. Trade register: hrb 2867; high court of weiden i. Do you still need an article? You will find it in the big universe of .. the item "kit set set discs + brake pads front axles + rear 32129925" is for sale since Wednesday, August 2, 2017.